Stay tuned for little bits of gossip or helpful tidbits in the Ragdoll world. For more information about us or to check on kitten availability contact us! 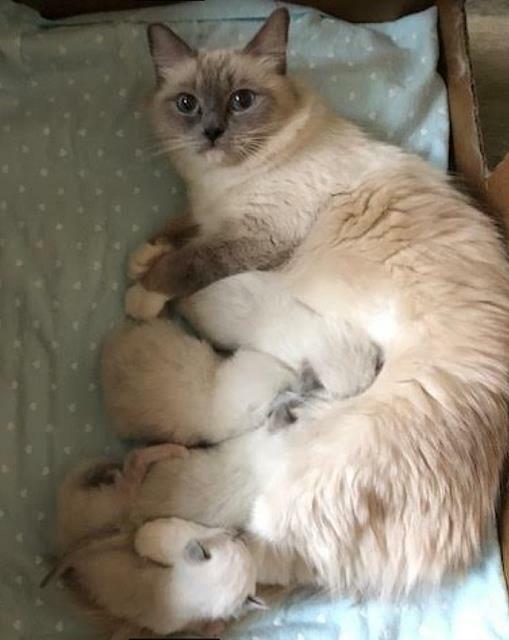 We are a small Texas Ragdoll kitten breeder registered with TICA and CFA. We are located just north of the Dallas and Fort Worth area in Sanger, Texas. Actually we are located between Denton, Texas and Sanger, Texas, just off the I 35, visitors welcome with appointment. We are within an hour of Frisco and Plano Texas. 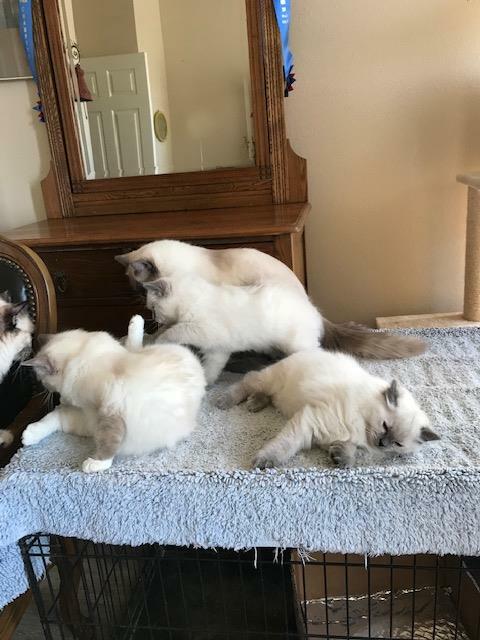 We should show up under Frisco Ragdoll Cats and Plano Ragdoll Cats available. 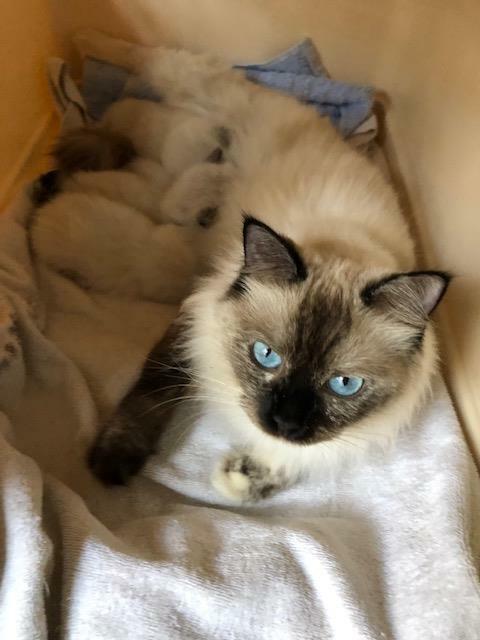 Recently, having retired from breeding and showing colored horses, we are now using that expertise for breeding beautiful blue eyed, Texas Ragdoll cats. 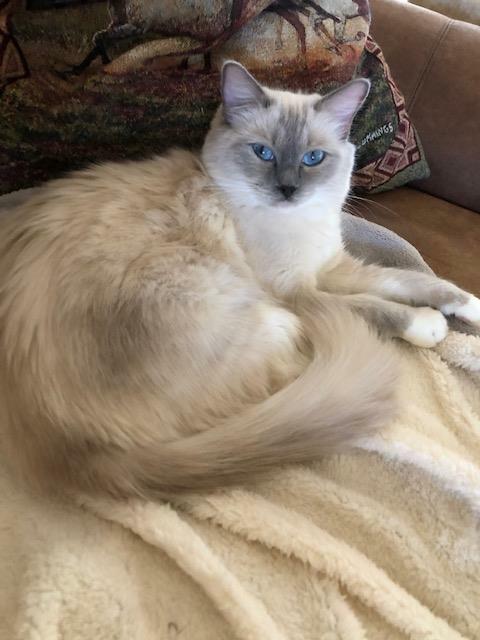 We breed the Ragdoll cats and kittens for their fantastic, cuddly disposition, for their blue eye color, great coats and good conformation by choosing the correct parents. Even at the young age of 11 to 12 weeks, the kittens run to greet us when they hear the garage door go up and we get home, they are so darling. They follow me from room to room, just like dogs, they are so attentive to what you are doing they want to be in the middle of it. Contact me about pricing. I usually ask for a deposit when you choose your kitten, then the balance is due when you take your beautiful Ragdoll kitten home. Your little guy or girl will have all of it’s shots but one and will have been litter trained and will be altered. The last shot is at 16 weeks and you will have them to your vet for that. I put a dose of Revolution on them as a preventative as they transition to a new home and maybe new pets of yours. Mable Roberts of Willow Tree Rags gave me the confidence to choose kittens for my future endeavors. She has been a great help to get me started with females and we appreciate her very much. A special thank you to Adrienne Griffin for her kindness and expertise in helping us get started with our breeding program with our Kings and beautiful Queens. We love to help our new Ragdoll enthusiasts! 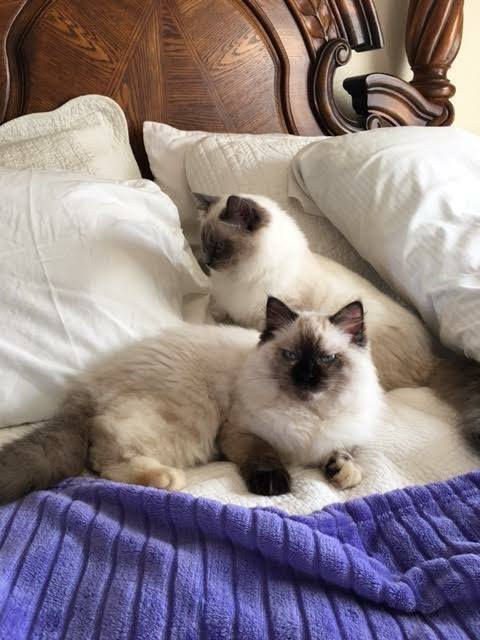 We enjoy keeping in touch with the new owners to hear about their success and happiness with their new blue eyed, Texas Ragdolls. 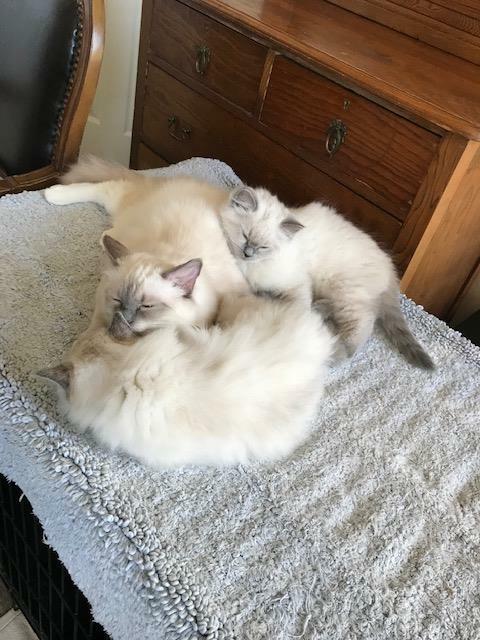 We welcome owner reviews, well-being reports, videos and updated photos of their beautiful Ragdoll kittens and cats! 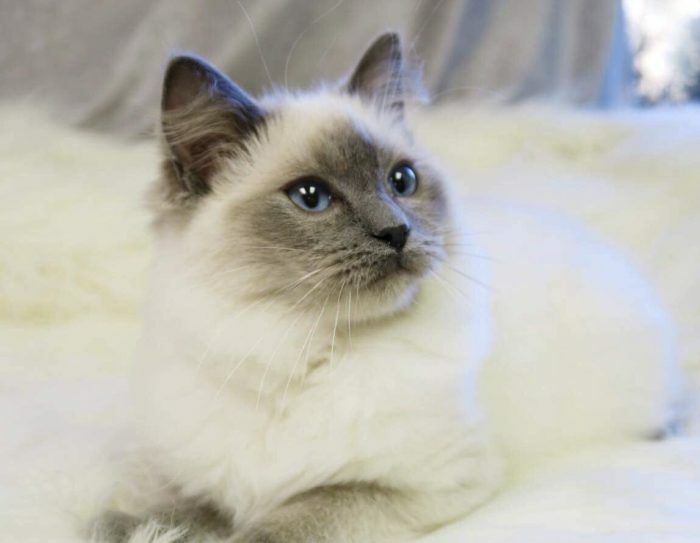 You can schedule an appointment to come by and meet our beautiful Texas Ragdoll cats and kittens anytime. We love to meet Ragdoll enthusiasts! 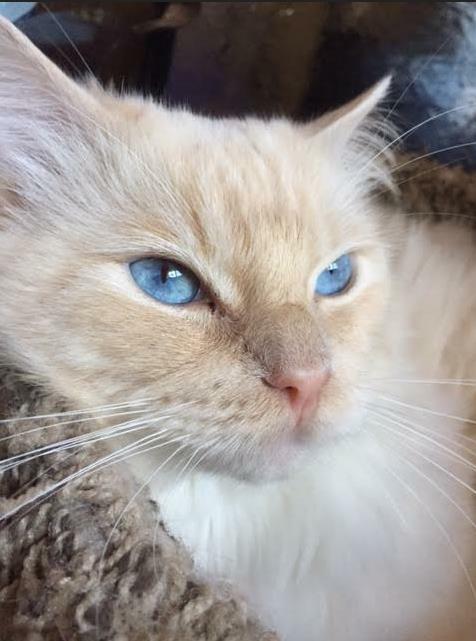 I look forward to hearing from you all about your Ragdoll kitten and cat adventures…thank you.